Without digging into the semantic details too much, auteur theory -- the idea that a single, charismatic designer can leave his mark on a game -- was a popular talking point a few years ago. While no longer part of the games criticism zeitgeist, auteur theory is usually applied to the monoliths of the games industry (Shigeru Miaymoto, Gunpei Yokoi, Will Wright), or the unapologetically quirky (Goichi Suda, Keita Takahashi). 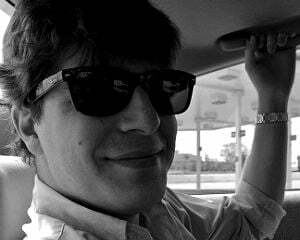 I might submit to this category James Silva, co-founder of and lead designer at Ska Studios. His most recent game, the 2D beat-'em-up The Dishwasher: Vampire Smile, is such a weird amalgam of pop culture, so bizarrely presented that it couldn't have come from anyone else: if it weren't so fun and polished, I'd call it a vanity project. Vampire Smile wears its influences on its sleeve: the plot reads like a bloodier, more straightforward Count of Monte Cristo; the setting is equal parts cyberpunk and kung-fu flick; the visuals ripped from, say, a Megadeth show in 1988. These elements are blended together to form an aesthetic that, while culturally disjointed, should seem familiar to most twenty- and thirty-somethings. Vampire Smile's twin campaigns follow the eponymous Dishwasher and his stepsister Yuki in the events directly following the first game. The backstory is all a bit muddled -- especially if you never played the original Dishwasher -- but I'm pretty sure that the cyborg shadow government has set up shop on the moon; the Dishwasher wants to save the world (I think), and Yuki wants revenge on the people who framed her as a terrorist. The two different campaigns are similar but ultimately serve two different purposes. Yuki's is a more structured affair, and Silva's treatment of her psychological trauma is excellent -- Yuki is often unexpectedly sucked into a nightmare world which would be creepier if it weren't filled with on-screen button prompts. Silva's real success, though, is in the level design: the early maps are full of dead ends, secret passages, and looping corridors around fantastically oppressive and gloomy crypts, dungeons, and government prisons. The levels aren't so big that Yuki gets lost, per se, but the assets are similar enough for players to feel disoriented. This disorientation compliments Yuki's in-game paranoia nicely, and you'll never know when she'll have a psychotic breakdown. 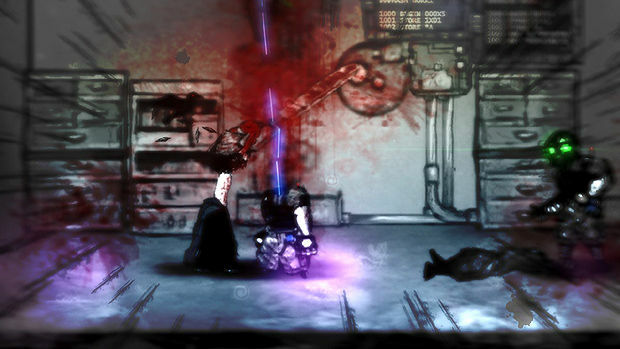 Making the player feel vulnerable works in Vampire Smile's favor -- the combat serves as a release valve, a cathartic bloodbath that eases tension. On the other hand, the Dishwasher character's campaign lacks any subplot, and his narrative moments are largely expository as he generally sticks to explaining the backstory. It's nice that the Dishwasher offers some context for the ill-articulated plot, but his campaign takes place after Yuki's -- he is always a few steps behind his sister's bloody path through the lunar cyborg capital. Players have two choices: play in chronological order and be confused for half of the game, or play the Dishwasher's story first and ruin what little pacing and structure there is. There are a few places where Ska Studios tries to compensate for this discrepancy, but all it does is create plot holes. In any case, the exposition that bookends each fifteen-minute level vascillates between being melodramatic and purposefully obtuse and the characters -- with names like The Fallen Engineer and General Diaboli -- are cheesy, pulled along on the strength of the game's gruesome visuals. The whole package works, but just barely, toeing the line between campy pop culture explosion and caricature. 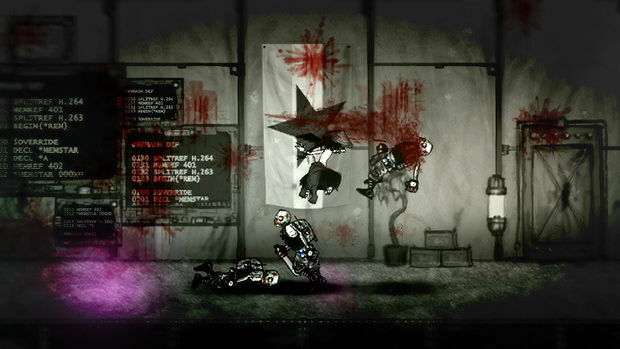 Most of the time, Vampire Smile's strange offerings are fun: enemies include, for example, a blind cephalopod samurai, a dismembered zombie shark with robot legs, or a two-story, fire-breathing skeleton sporting tank treads and a fur vest. There are times, though, when Vampire Smile's own desire to stand out is detrimental. Peppered throughout are short Guitar Hero-esque mini games that can be played with guitar peripherals. I didn't bother -- the segments are distracting enough without taking the time to lug a big plastic thing out of the closet. If it weren't for the dropped money -- used to buy upgrades for your weapons or magic -- most people would skip them. Late in the game, a text adventure section is equally problematic: when Ska Studios plays with retro game mechanics, it says more about its love for rock music and old adventure games than it does about the world or characters of Vampire Smile. What does tell me about the characters of Vampire Smile is the game's combat. Watching Yuki rip someone's throat out with her teeth communicates insanity to me better than the story does; seeing the Dishwasher pull an enemy's head off like a grape does the same thing. The combat is obviously the Dishwasher's strong suit and where Ska Studios devote the most of its effort. The hand-drawn animations are fluid and pop out of the backdrops nicely; the controls are tight and responsive; and there are limitless options for juggling combos and chains, thanks to your ability to "blood warp" with a simple flick of the right analog stick. Both Yuki and the Diswasher have four melee weapons, four magic spells, and two ranged options with which to slice, cut, crush, pommel, hack, electrocute, blast, and saw a host of zombies, cyborgs, ninjas, cyborg ninjas, and ninja cyborgs. Vampire Smile is also quite well-balanced, with a slow and steady difficulty arc: I died often but rarely felt frustrated. The boss fights are particularly fun: each one requires a different strategy, each one teaching me how to better time my evades or how to use a more efficient combo. Vampire Smile is a hard game, no doubt, but that's mitigated by the game's co-op functionality (local or online) and what my mustachioed colleague Conrad Zimmerman calls "girlfriend bait." Both the Dishwasher and Yuki have pets that follow them around; I've dubbed them MurderBird and LaserCat, respectively. In single-player, they just hang out and look cool, but a player using the second controller can control them, a would-be allusion to Tails from Sonic 2, if Tails could shoot lasers out of his eyes. They're easy to use, play a supportive role, and -- better yet -- can't die. The muted color scheme works well during combat, with each enemy's accent color -- green eyes or a bright blue vest, for example -- standing out against the black and and grey scenery. The powerups are similarly accented, making it easy to find health and magic powerups when you desperately need them. 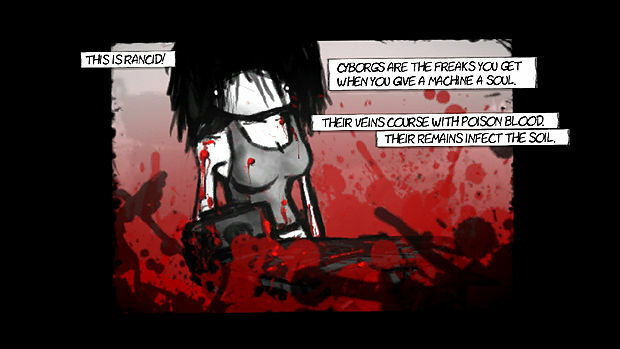 That's not to say that Vampire Smile has to be mindless, as so many beat-'em-ups are wont to be. It certainly can be -- button-mashing works to an extent -- but money, health, and magic are dropped from enemies dispatched with special finishing moves (generally triggered by following on-screen prompts). It's not necessary to master these special moves, but Vampire Smile is tough enough that a light, well-timed touch is rewarded. Vampire Smile also uses slow-motion to great effect: a slow-down signals a narrowly evaded attack or a finishing blow. Vivisecting an enemy frame by frame gives an added sense of weight and resistance, visual feedback that suggests you're cutting through sinew and bone and not just polygons. In terms of cathartic dopamine drip -- pleasure, punishment, motivation, learning, empowerment -- the purity of James Silva's vision is clear, though stunted. Unfortunately, the lack of enemy variety or complexity hobbles the combat mechanics -- most enemies in the game are dispatched exactly the same way. Once you learn which weapons you like and the fastest ways to use them, Vampire Smile turns stale. Successful experimentation leads to muscle memory leads to rote actions: grap, juggle, evade, finishing move, ad infinitum. Vampire Smile never forces players to use anything besides, say, the Shift Blade; and at the end of both three-hour campaigns, I could juggle enemies in my sleep. As the maze-like level design of the first two-thirds of the game gives way to long corridors and boss-rush arenas, Vampire Smile borders on tedium. With very little to differentiate the two campaigns or the two protagonists, this weakness crops up relatively early in the total package. To put it another way: after a few hours, enemies begin feeling like a pesky chore sitting between the player and the next fun boss battle, not another chance to explore the game's combat. Thankfully, Arcade Mode returns, offering fifty short, one-off levels. Each level follows a general scheme -- kill all the enemies -- but there tend to be rules in place that change players' approach to each level. There may be a time limit, or special laws governing damage output or health regeneration, or -- and this is my favorite -- restrictions on which weapons you can use. More so than the story mode, the arcade forces players to experiment and use their limited resources the best they can. There are leaderboards for speedruns and the number of points scored on a given story level, but Arcade Mode is where players looking to learn and master Vampire Smile's mechanics will linger. 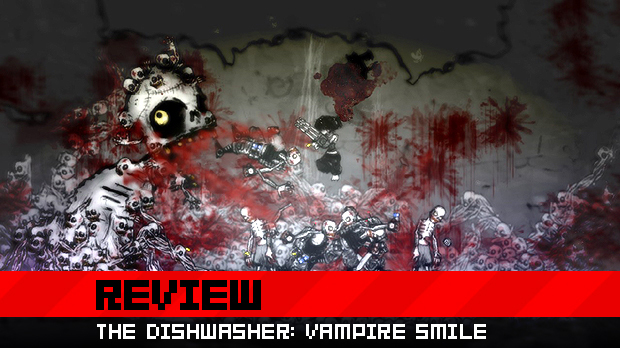 The Dishwasher: Vampire Smile is a fun, quirky game, one whose strength lies in the care with which it was created. Playing Vampire Smile is like having a conversation with James Silva; and what a grotesquely fantastical conversation it is. 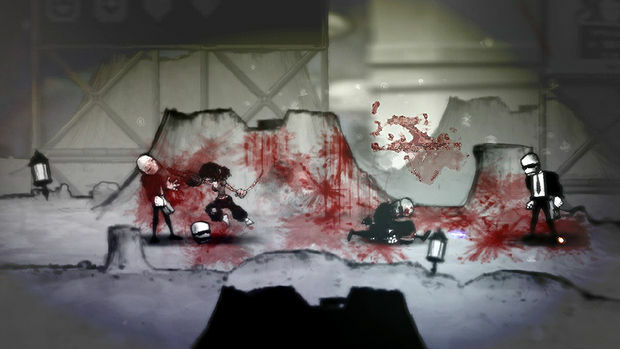 Its goofy violence and goofier character design, married to its bleak aesthetic, are almost enough to keep players' interest on their own and are complimented well by tightly-designed combat. It's unfortunate that the game doesn't live up to its own potential, though -- the convoluted story wastes the potential of the rad premise, and Silva doesn't do enough to keep the combat fresh for the duration of the game. Vampire Smile can be loads of fun, but that fun is fleeting.